Each winter, thousands of northerners journey south to escape the frigid weather. They then return north in time to watch spring blossom. We have come to know them as snowbirds. Many people choose to drive their own vehicle both routes, North and South. However, we find that it is the most experienced snowbirds that have learned that transporting can save them a great deal of time, money, hassle, and wear and tear to their vehicles. We will transport it specializes in Snowbirds transport. Snowbirds transport is generally used by people traveling down to Florida from places like: Canada, Pennsylvania, New York, Illinois, Michigan, Wisconsin, Indiana, Ohio, Connecticut, Maine, Massachusetts, and all over the country. A large percentage of these people are retirees and seniors that have been making the trip for years. Snowbirds Transport season generally lasts between the months of September and June. During these times of year there are 250,000+ vehicles that need to be shipped. Due to the multitude of vehicles needing to be shipped at one time and during the same time period, the cost to transport will be slightly more expensive simply because of the increase in demand. Usually most people make the mistake of waiting too long before booking their reservation for their vehicle to be shipped. This could be very expensive due to the fact that there aren’t enough carriers to fulfill all the orders at one time. This can also be a nightmare especially if you are dealing with a company that is not interested in shipping your vehicle as much as they are about collecting an upfront deposit. We Will Transport It does not take an upfront deposit to ship any car, truck, minivan, or SUV and we highly recommend you don’t deal with any company that does. Here are some snowbirds transport tips that will help you get better results if you are shipping anywhere from the North to Florida. Best Snowbirds Car Transport Company in the US. Retirees and Seniors Rely on Us for Snowbirds Transport!Each winter, thousands of northerners journey south to escape the frigid weather. They then return north in time to watch spring blossom. We have come to know them as snowbirds. Many people choose to drive their own vehicle both routes, North and South. However, we find that it is the most experienced snowbirds that have learned that transporting can save them a great deal of time, money, hassle, and wear and tear to their vehicles. We will transport it specializes in Snowbirds transport. Snowbirds transport is generally used by people traveling down to Florida from places like: Canada, Pennsylvania, New York, Illinois, Michigan, Wisconsin, Indiana, Ohio, Connecticut, Maine, Massachusetts, and all over the country. A large percentage of these people are retirees and seniors that have been making the trip for years.Snowbird season generally lasts between the months of September and June. During these times of year there are 250,000+ vehicles that need to be shipped. Due to the multitude of vehicles needing to be shipped at one time and during the same time period, the cost to transport will be slightly more expensive simply because of the increase in demand. Usually most people make the mistake of waiting too long before booking their reservation for their vehicle to be shipped. This could be very expensive due to the fact that there aren’t enough carriers to fulfill all the orders at one time. This can also be a nightmare especially if you are dealing with a company that is not interested in shipping your vehicle as much as they are about collecting an upfront deposit.We Will Transport It does not take an upfront deposit to ship any car, truck, minivan, or SUV and we highly recommend you don’t deal with any company that does. Here are some snowbirds transport tips that will help you get better results if you are shipping anywhere from the North to Florida.Book your reservation at least 30 to 45 days ahead of time; this will save you money and secure you a spot on our rig. Provide the year, make and model of the vehicle.Please let us know if you prefer enclosed or open transport. (enclosed is more expensive due to the insurance requirements; ask the agent about pricing and availability for enclosed shipping).Allow flexibility on dates for pickup and delivery.We Will Transport It agents and dispatch department will work hard making sure your vehicle arrives on time and in excellent condition once it is delivered to you. The average time for a snowbirds transport usually takes about 3 to 5 days from pickup. If you are an AARP member, let our agents know at the time of your snowbirds transport quotes to redeem your discount. Please allow the driver flexibility for traffic and weather when transporting your vehicle. Having your vehicle arrive safely is our top priority.Call 877-880-5991 for a Free Quote! 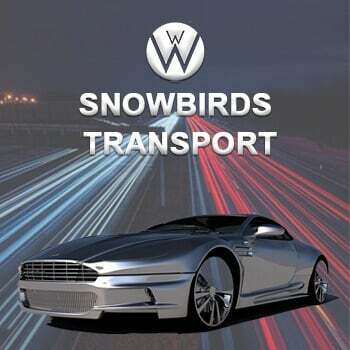 ARE YOU LOOKING FOR SNOWBIRDS TRANSPORT SERVICES? We Will Transport It is the Best Snowbirds Transport Company in the U.S. The average time for a snowbirds transport usually takes about 3 to 5 days from pickup. If you are an AARP member, let our agents know at the time of your snowbirds transport quotes to redeem your discount. Please allow the driver flexibility for traffic and weather when transporting your vehicle. Having your vehicle arrive safely is our top priority. ARE YOU NEEDING OPEN TRANSPORT CAR SHIPPING?